After careful consideration of its financial and business position, the leadership of the Magic has decided that the corps will not tour in the 2007 season. 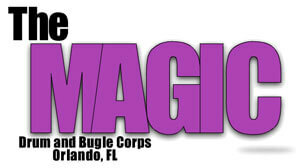 "We have some revenue commitments that are, thus far, unfulfilled," said Bruce Ziegler, CEO of Magic Drum & Bugle Corps, Inc. "Sadly, this compromises our ability to participate in the 2007 tour." Magic Drum & Bugle Corps, Inc. leadership has made great strides over the last three years, significantly reducing the organization's debt. Further, the corps has successfully toured three seasons without incurring new debt. In spite of these accomplishments, fundraising efforts to correct a significant budget shortfall have been unfruitful. The Magic will use the 2007 season to reorganize and solidify its business standing and perform a talent search for a full-time director. "It is regretful that we must take such extreme measures," said Ziegler. "We have a great staff in place and the highest number of returning vets we've seen in many years. It was a tough decision, but we all agreed that standing down for the season is the responsible thing to ensure the future of the corps."